Really, truly, I had other things to do today. That involved being outside. Stacking wood, planting some ground cover, trimming. It's supposed to rain tomorrow, so it had to be today. But that pasta maker called to me. "You missed me! You really missed me! 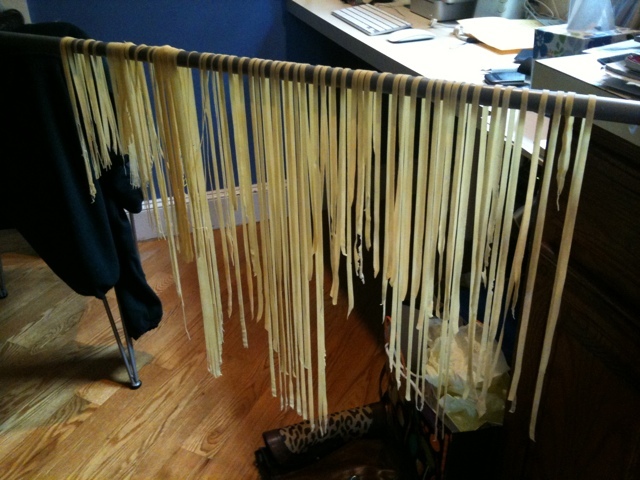 I want to make pasta with you!" I now have 3 and half dozen pumpkin raviolis, about one dinner each of spaghetti and fettucini, and a pile of stacked wood. I used a basic pasta recipe: 1 pound of flour, 5 eggs, and a little olive oil. For the pumpkin filling, I made it up. I roasted a sugar pumpkin in the oven at 400 degrees for 45 minutes. Then I scraped out the flesh and chilled it a little. I squeezed out all the water and added freshly picked and chopped sage (about 8 large leaves), half a container of whipped cream cheese, salt, pepper, and a little nutmeg. I had a few technical difficulties making the raviolis, considering it's been about 16 years since I used the press I guess I forgot a few things. So, note-to-self: flour the press, use thickness 6 (consider thickness 5), and don't overfill! 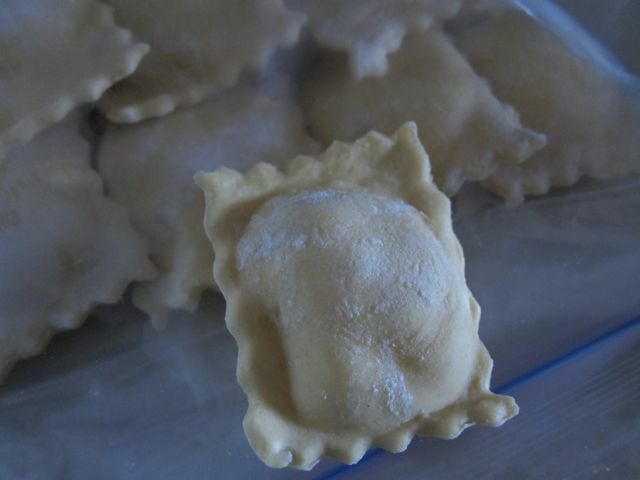 Since I don't anticipate we'll eat all the ravioli tonight, I froze 2 dozen - currently they are sitting on waxed paper in the freezer and, when they are frozen, I will transfer them to bags. 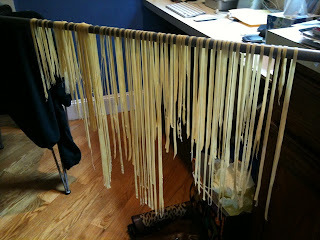 When the rest of the pasta is dry, I will figure out how to store it. Thank you! I have a pasta maker that I bought at a yard sale but didn't have a pasta recipe. I just have to try making some of my own! Yours look great.